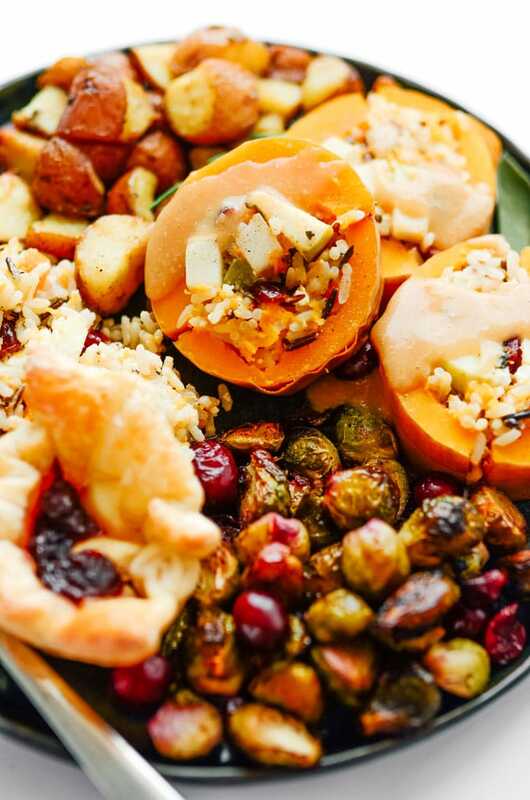 This full vegetarian Thanksgiving dinner has everything you want in an easy Thanksgiving meal, from the beautiful centerpiece to the cranberry sauce-topped melted brie bites! I’ve never quite understood why turkey has to be the center of attention when it comes to Thanksgiving. I mean it’s finicky as frick, dries out easily, and isn’t actually all that nice to look at. 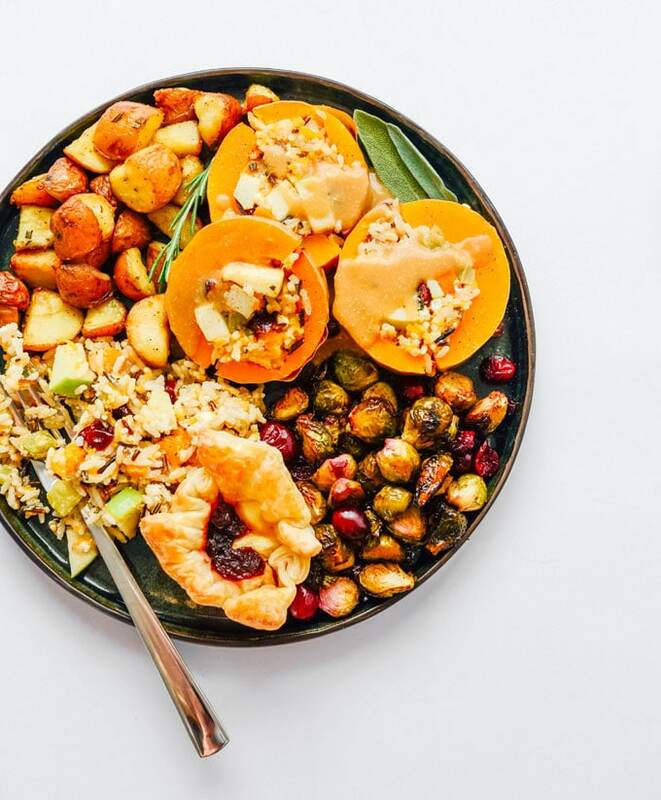 But then there are the bounties of autumn harvest, namely butternut squash and pumpkin, with their bright colors and versatility and foolproofness. Can we make a Thanksgiving main course with them? Heck to the yes! 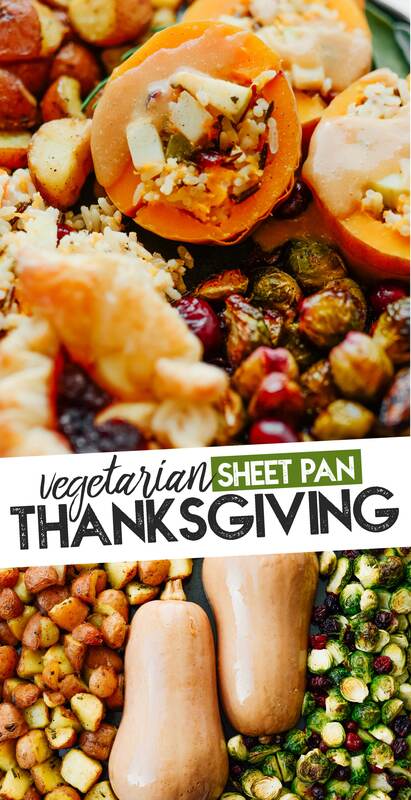 But why stop with a vegetarian Thanksiving main dish? Today we’re making the whole damn meal. 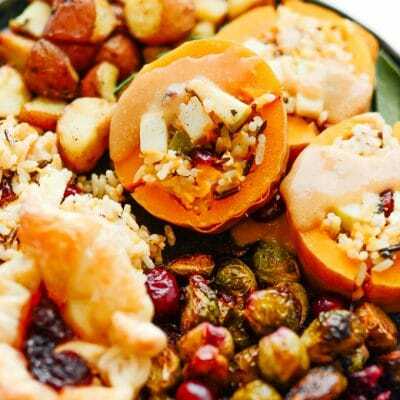 It’s the gourmet vegetarian Thanksgiving dinner that dreams are made of. Especially if those dreams entail a Thanksgiving dinner that’s relatively easy and doesn’t dirty up the whole kitchen. You ready for this? Let’s do it. 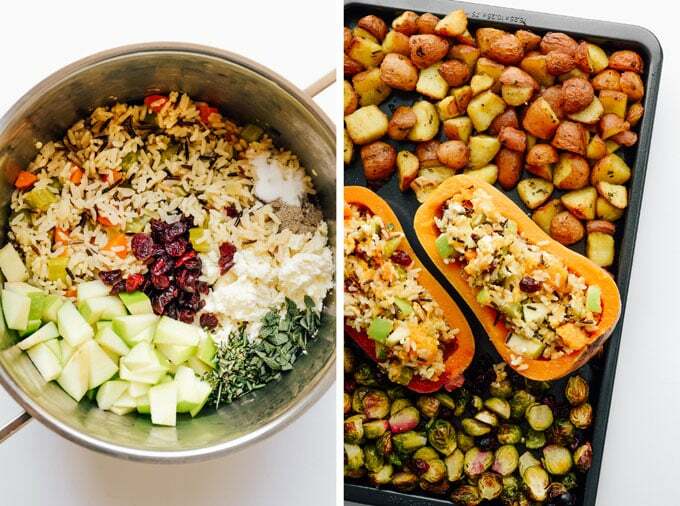 Scroll down to see how all of this can be made using just a sheet pan and a muffin tin! Let’s start with our main course, an herby stuffed butternut squash. Wild or regular rice will be the base of this recipe, laced with herbs, veggies, cranberries, apples, feta…the whole arsenal of fall flavors, y’all. We’ll pre-cook our butternut, scoop out the insides, and mix it into the rice mixture. Then all that downright deliciousness will be stuffed back into the butternut, tied together, and baked once more. Then there are the sides, Brussels sprouts and crispy potatoes! 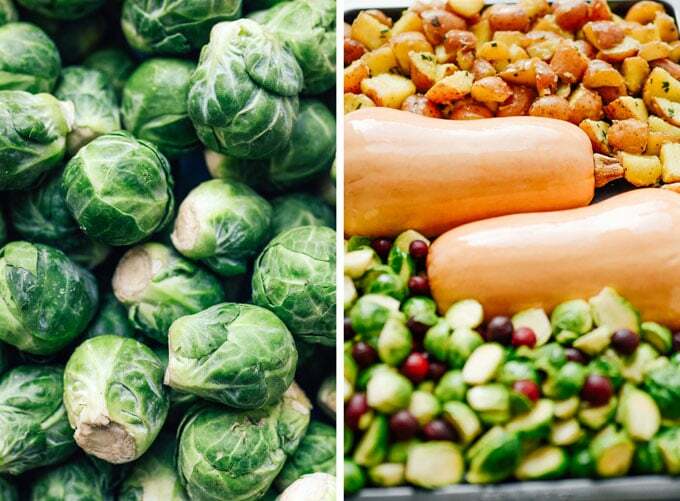 The Brussels sprouts are tossed together with fresh (or frozen) cranberries and olive oil then roasted to perfection. The potatoes take a page out of Jamie Oliver’s book. We’ll parboil them first then shake shake shake to chuff up the edges, making for maximum crispiness while roasting. And to finish off this vegetarian Thanksgiving dinner…CHEESE! Specifically, Brie and cranberry sauce stuffed puffed pastry bites. This simple side is quick to prepare and you can pop it in the oven when the main sheet pan is nearly finished. And that, friends, is what I call a meatless Thanksgiving! If you’d like a printable PDF with all of the instructions and a grocery list, enter your email here and it will be sent right to ya. 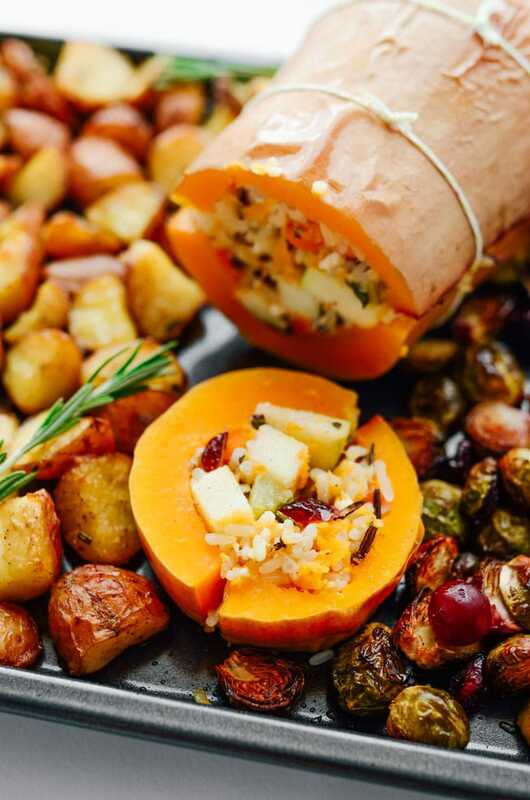 Make Butternut Stuffing: Heat 1 Tbsp oil in a medium pot over medium heat then add carrot, celery, onion, and garlic. Cook until fragrant and veggies are brightly colored, about 3 minutes. Add rice and broth, cover, and let simmer until rice is cooked and broth is absorbed, about 15 minutes. Stir in feta, cranberries, apple, rosemary, sage, salt, and pepper. Cover to and set side. 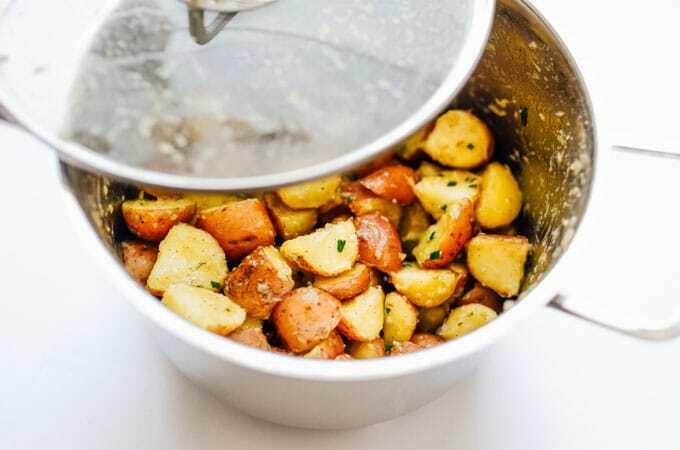 Boil Potatoes: Bring a large pot of water to a boil (about 6 cups water) then add baking soda and 1 Tbsp salt. Add quartered potatoes and cook until fork tender, about 10 minutes. Drain water and let potatoes sit uncovered for 2 minutes to dry. Put on the lid then vigorously shake to chuff up the outside of the potatoes. Add olive oil, rosemary, salt, and pepper, then shake once more to evenly coat. Set aside. Prep Brussels Sprouts: Toss to combine sprouts, cranberries, oil, salt, and pepper. Set aside. Bake Main Sheet: Preheat oven to 400 degrees F (204 C). Cut butternut in half lengthwise and spoon out seeds. Liberally coat all sides with olive oil, sprinkle with salt, and lay face down in the middle of a large rimmed baking sheet. Spread out potatoes onto one side of the butternut and Brussels sprouts on the other (it’s okay if they’re not completely in a single layer now). Bake for 30 minutes, or until butternut is fork-tender. 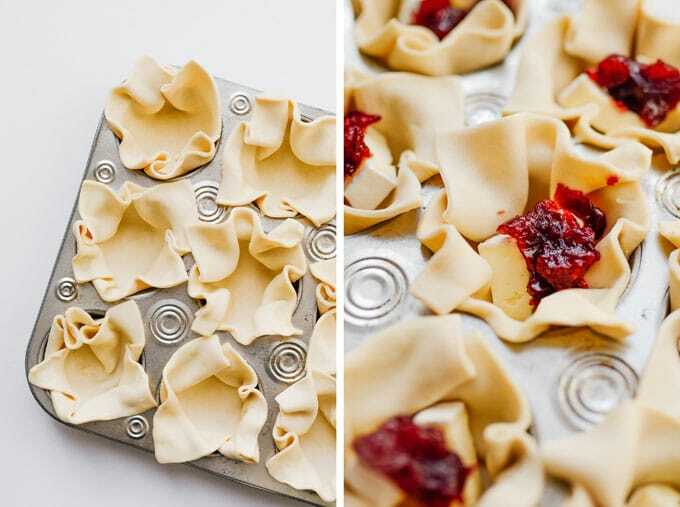 Prep Brie Bites: While that bakes, press each puff pastry into a muffin tin well. Add a few pieces of Brie and top with a dollop of cranberry sauce. Brush dough with egg. Set aside. Stuff the Butternut: When butternut is fork-tender, scoop flesh from the inside, being careful to not puncture the skin and leaving a thin layer on the outside (hold it with some paper towels if it’s too hot to handle). Stir the scooped out flesh in with the rice mixture, then stuff the mixture into each half of the butternut, firmly packing it in (you’ll have leftover stuffing). Stick the two halves together and secure it by tying with kitchen string. Set back on the baking tray. Flip Side Dishes: Flip the potatoes and Brussels sprouts for even cooking, spreading out into a single layer if possible. 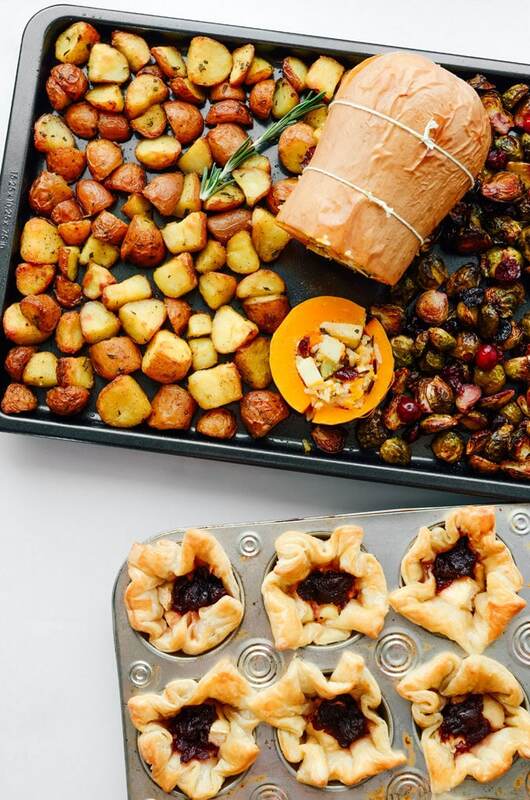 Bake Everything: Into your oven place your main baking sheet with the butternut and sides (lower rack) and the muffin tin with the Brie bites (upper rack) and cook for 15 to 20 minutes, or until puff pastry is golden and crip. Remove Brussels sprouts if they begin to darken too much. Make Gravy: While that bakes, prepare gravy. Melt butter in a small pot over medium heat. Add flour then, whisking constantly, slowly pour in the broth until your reach a thick gravy consistency (you may not need all of the broth). Whisk in the remaining gravy ingredients, remove from heat, and cover to keep warm. Serve: Carve stuffed butternut into 1-inch thick slices and serve topped with gravy. Extra rice stuffing makes a great side (room temperature is okay!) along with your crispy potatoes, Brussels sprouts, and Brie bites. Happy Thanksgiving! 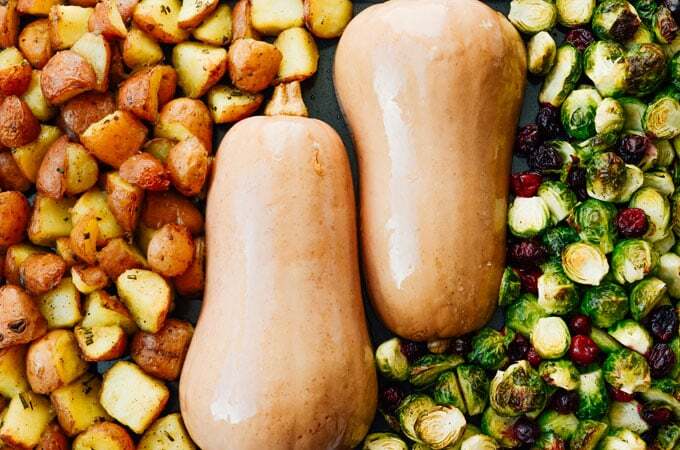 Get all of these instructions and a grocery list for this complete vegetarian Thanksgiving dinner. Just enter your email in the box below and it will be sent right to you!